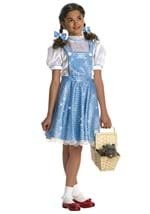 Treat your tot like they are a part of the group this Halloween in one of our Wizard of Oz toddler costumes! We carry a large selection of toddler costumes so you will find the perfect one for your child. Get your toddler into one of our Glinda costumes for a beautiful look this Halloween or into one of our Cowardly Lion costumes for a courageous look. No matter what look you are going for, we are sure to have the perfect costume in a size that is just right for your toddler!